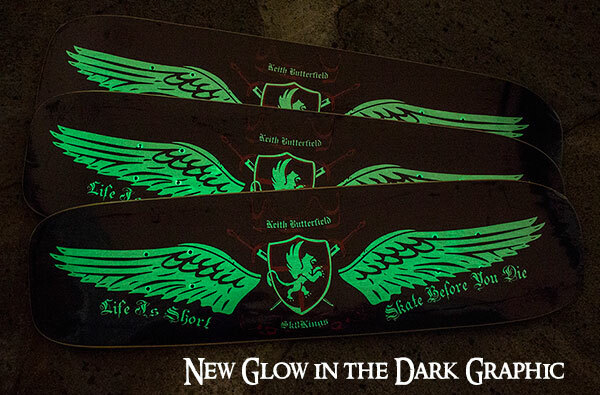 27.5" x 7.25" Wheelbase: 11.75"
Ships ready to ride out of the box. This complete combo offers optimal balanced rail set up for flatland freestyle. 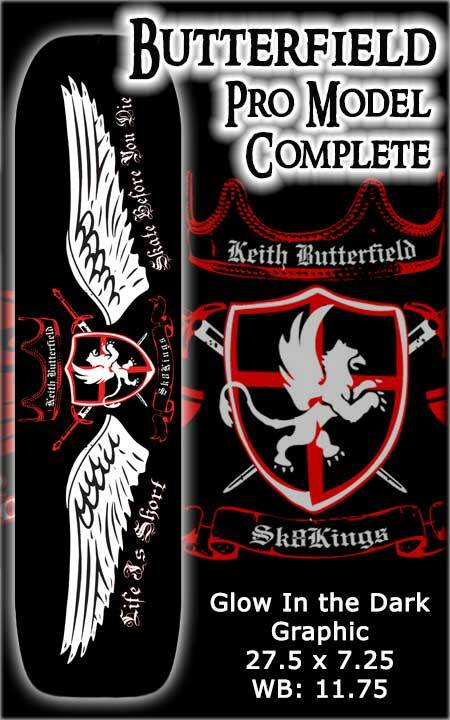 All Sk8Kings Completes come expertly assembled using only top shelf components - a set up fit for a King! 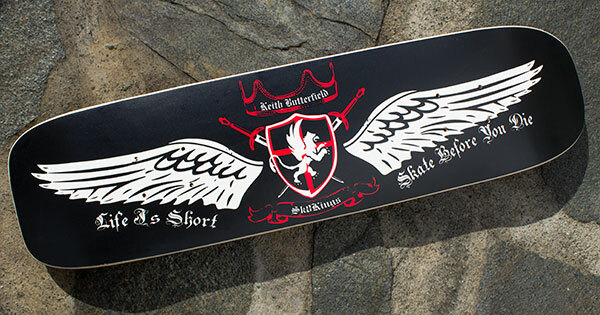 Keith Butterfield Deck - concave, double kick deck - 27.5" x 7.25" Wheelbase: 11.75"
OPTIONAL UPGRADES- King Plate Skid Plates, stainless steel kingpins, bearing selection and accessories - see UPGRADES below. Oust Bearing Care - add a bottle of Oust Metol Speed Lube - to keep your bearings lubed and ready to roll. The Oust Speed Kleen Bearing Wash Kit is also recommended for periodic thorough cleaning of your bearing set. Add either or choose the "both" and save a couple bucks. Sk8Kings Shirts/Hats - Save $5 on a logo T-shirt, Hoodie or Hat when ordered with a deck or complete. Choose the item to add and indicate logo choice and size in the notes section when ordering. Choices subject to availability. Regularly $30 if purchased separately - Save $10 with this deal! on the rear truck whenever you want -- for a killer 360 Spinner setup option. Choose the add on item when ordering to get this deal.